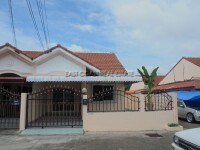 Two Bedroom / Two Bathroom semi-detached bungalow, located on Lake Villa Resort, just off Mabprachan Lake. The house is sold fully furnished, and features a European Kitchen, an air conditioned lounge, 2 bedrooms, the master being en-suite. The house has a storage area at the back and a patio area in front of the house looking out onto the large communal pool and gardens. The village is close to many local Thai markets, convenience stores, restaurants and provides easy access to the 7 and 36 motorways. The title deed is registered in Company name, making transfer of ownership simple and inexpensive. Living area : 90 sqm.